Isolated forested lowland rised-bogs and transitional mires without larger bog-lakes. The core area consists of three localities, Červené blato (Red Bog), Široké blato (Wide Bog) and Žofinka, that are overgrown by bog pine forests of Pinus rotundata, with Ledum palustre in the understory. The mires of the Quaternary origin have a maximum peat depth of 6–7 metres. They are found in flat valleys, partly fed by artesian waters and partly by rainwater. In places, there exists an old forestry drainage system which no longer fully functions anymore. Peat extraction took place on smaller areas up until the 1st half of the 20th century. These places have since been regenerating spontaneously. The groundwater table is stable. The local topography is flat or slightly undulating (Třeboň Basin) with a lack of sharp relief. Underlying rocks are primarily Cretaceous and Tertiary sedimentary (clay, sandstone, sand) with some crystalline rocks (granite, gneiss) present in the undulating eastern part of the site. Bogs developed at badly drained terrain depressions, some of them are saturated with water both from precipitation and from artesian groundwater springs. Soils are composed of clays and peats (peat layer max. 8 meters deep). The moderately warm climate is marked by relatively long periods summer of clear weather with an annual mean air temperature of 7.8°C and annual mean precipitation of 627 mm. Fog occurs frequently due to large wetland and fishpond areas in the vicinity. Winter snow cover is up to 35 cm (snow cover 60-80 days per year). 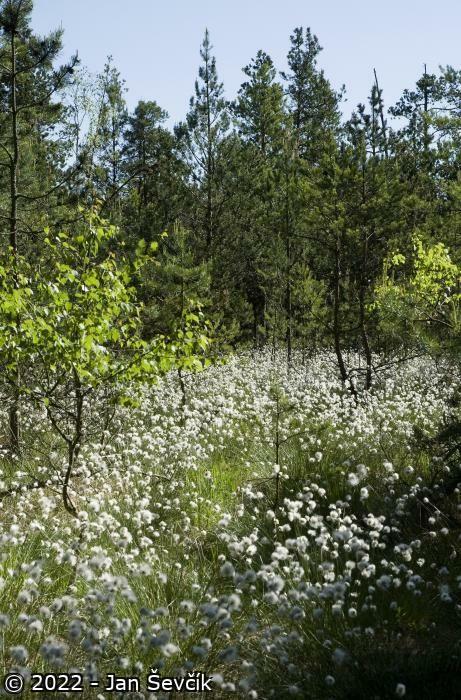 Apart of bog pine forests, the most valuable are communities of invertebrates associated with Ledum palustre and other characteristic mire plant species. In the outer zones of the mires, Pinus rotundata is replaced by Pinus sylvestris and Picea excelsa. The herbaceous layer is species-poor, dominated by bilberries (Vaccinium myrtillus) and cowberries (Vaccinium vitis-idaea). Mosses are dominated by Sphagnum capillifolium and other Sphagnum species. The sites where peat extraction took place in the past have spontaneously developed the initial stages of mires, with dominant species of Sphagnum and Eriophorum. The minerotrophic mire Ruda was originally without any tree cover, today though it is being overgrown, mainly by Salix, Frangula alnus and Pinus sylvestris. The site is a part of the Třeboňsko protected landscape area (PLA) declared by the Czech government in November 1979 (UNESCO MAB Biosphere Reserve Trebon Basin (BR) established already in March 1977). PLA/BR covers 700 square kilometers and creates a protective zone for this Ramsar site. The site itself covers the most valuable parts of the PLA/BR - it is core area and buffer zone. 5 small-scale nature conservation areas (nature reserves of national or regional importance) have been declared within the Ramsar site. Zonation of the Třeboňsko PLA was approved by the Czech Ministry of Environment in October 1995. Each nature reserve has its own Management plan valid for 10 years. All designation decrees and Management plans are elaborated by the state nature conservancy in order to protect most significant values and phenomena of the site including the wetlands habitats and wetland species (in terms of Ramsar Convention). The state of the conservation areas and their management plans are periodically revised. The latest management plans for peatbog reserves comprise forest management (mostly no intervention to natural development of forest is planned or just measures aimed at improvement of a tree composition with priority given to native species), damming and insulation of drainage canals to reduce unwanted water discharge, building of shallow lagoons of open water to increase bog diversity, reduction of invasive shrubs and mowing of wet meadows). Better cooperation exists between the state nature conservancy and state forest authority. Private land is being purchased by the state. Nature conservation areas, forestry harmonized with conservation goals. The areas surrounding the mires is exposed to intensive forestry and tourism. Within the mire reserves, the illegal collection of bilberries occurs. The main problems are the frequent shortage of rainfall and an unwanted succession of vegetation. The die-back of several forest stands is caused, probably, by increases in groundwater level due to the silting up of old forestry drainage systems. 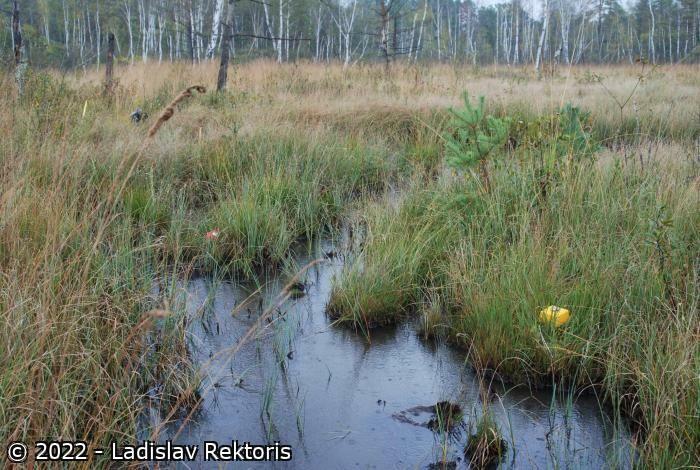 Hydrological values of peatbogs are represented by water retention, stabilization of water regime in the adjacent landscape and positive influence on local climate (cooling effect, increasing evaporation). Unique examples of isolated “island“ ecosystems giving evidence of post-glacial development of Central European landscape. Representative examples of a traditional human use of peatbogs (extraction of peat bricks for heating). Model research areas for the study of natural succession and bog regeneration. The oligotrophic forested mires (Červené blato, Široké blato, Žofinka) support unique stands of pine Pinus rotundata (association Pino rotundatae-Sphagnetum) with the largest populations of Ledum palustre in the Czech Republic. The characteristic formation of zones, represented by stands of Pinus rotundata (inner zone), through stands of Pinus sylvestris, to waterlogged spruce forest (in the surroundings), has also been mostly preserved. The mire named Ruda, located by Horusický fishpond, is the most valuable minerotrophic mire in the whole of the S Bohemian region, with relict communities of the alliances Caricion demissae, Eriophorion gracilis, Sphagno-Caricion canescentis and others. The herb layer contains the following species: Andromeda polifolia, Carex chordorrhiza, C. dioica, C. lasiocarpa, C. limosa, Comarum palustre, Drosera rotundifolia, Eriophorum gracile, Menyanthes trifoliata, Oxycoccus palustris, Parnassia palustris, Rhynchospora alba, Utricularia minor, U. intermedia, and Vaccinium uliginosum. The mires are host to many invertebrates completely unique for central Europe, resembling communities of subarctic bogs and fens. Characteristic species include tyrphobionts, many of which are glacial relicts. Besides tyrphobionts, the site supports a number of tyrphophilous species, i.e. species with looser links to the mire habitats. Both groups include many invertebrate species, mainly Arachnea, Lepidoptera, Coleoptera, etc. Not all groups have been studied in sufficient detail. Important invertebrate species: moths Arichanna melanaria, Autographa buraetica, Chloroclysta infuscata, Celaena haworthii, Coleophora ledi, Eupithecia gelidata, Lithophane lamda, Nola aerugula, Olethreutes lediana, butterfly Colias palaeno, beetles Agonum ericeti, Nebria rufescens, Patrobus assimilis, and Phaenops farmaneki bohemica. Large areas of forest also support vertebrates, which are, however, not so closely associated with mires. Breeding bird species reported include: Ciconia nigra, Tringa ochropus, Caprimulgus europaeus, Glaucidium passerinum, and others. Also elk Alces alces occurs ocassionally. The site is included in the network of International Long-Term Ecological Research Sites (ILTER). The Institute of Botany (section of plant ecology) of the Czech Academy of Sciences located in Třeboň, South Bohemian university and Institute of Entomology of CAS located České Budějovice ) are actively involved in research and monitoring of Třeboň Mires. 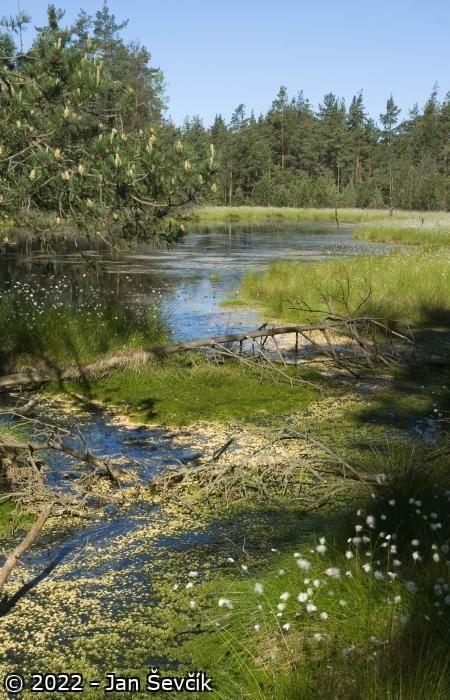 Main research topics: role and function of peatbogs in the landscape, peatbog climate, peatbog hydrology and hydrogeology, peatbog plant ecology, restoration of habitats after forest fires, cause of bog pine die-back, entomology (Lepidoptera, Coleoptera). Wetland Training Centre linked to Wetlands International has its unit in Třeboň, organizing research, national and international training courses and publishing books and information brochures. The Administration of PLA/BR is organizing some research, monitoring and inventories as a basis for its administrative role and for peatbog habitat restoration after industrial exploitation. Due to its natural conditions, this Ramsar site is not very often used for recreation and tourism compared to the Třeboň Basin PLA/BR as a whole. Public access is limited outside official roads and paths. Instructional trails were built at suitable locations. The “Red Bog“ instructional trail originated is very popular a frequently visited by both Czech and foreign visitors (several thousand visitors per year). At some peatbogs, illegal seasonal blueberry and cranberry picking and mushrooming is a specific problem which also increases a danger of forest fire. Třeboň Mires contains rare natural habitats (valley raised bogs and minerotrophic mires) that are representative for the post-glacial development of the landscape in this biogeographical region. The habitats are unique at presents compared to the surrounding cultivated landscape. Habitats of European importance are present at this site (Criterion 1). Třeboň Mires are host to vulnerable, endangered or critically endangered species and communities. 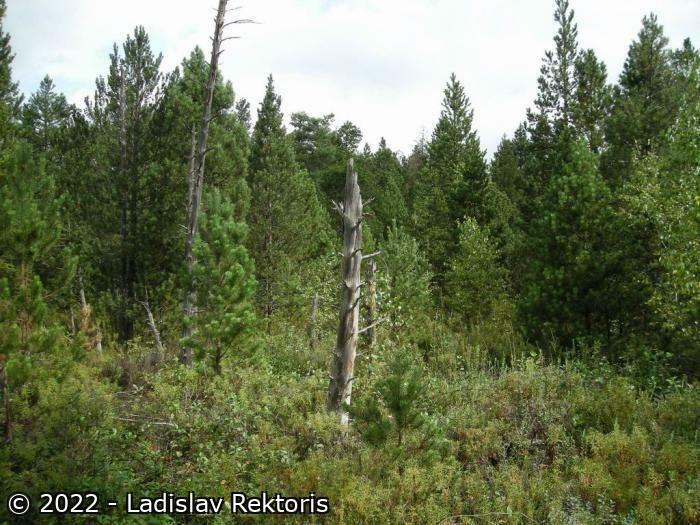 Largest Czech population of Pinus rotundata and Ledum palustre occurs at this site (Criterion 2). Breeding bird species reported include: Ciconia nigra, Caprimulgus europaeus, Glaucidium passerinum, Accipiter gentilis, Tringa ochropus, Bonasa bonasia, Bubo bubo, Nucifraga caryocatactes (Criterion 4).